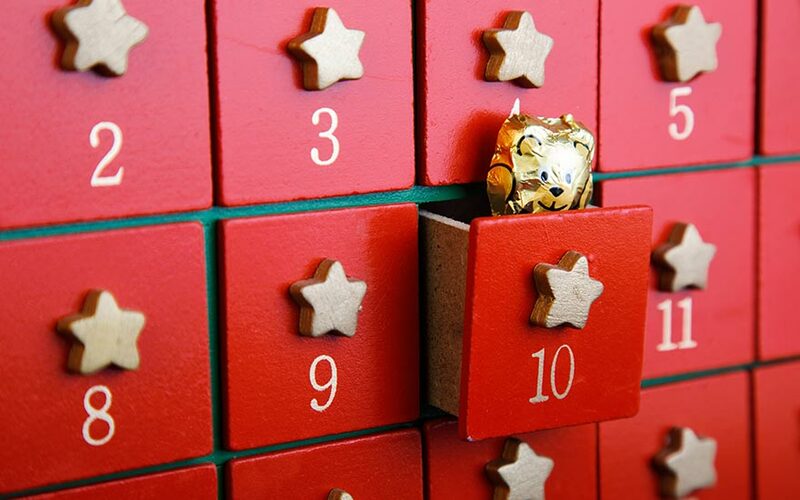 The Advent Calendar is a newer tradition compared to Santa, the Christmas Tree and the exchanging of gifts, but it has developed into being a well-known activity for many families, especially in Europe and the United States. The advent is considered the first twenty-four days of December, being a countdown for Christmas. Originally, the advent calendar was started by Protestant Germans in the 19th century. In its creation, the Advent Calendar was not exactly molded into this format. Instead, the Germans would use candles to signify the days and chalk to write out their own calendars. The idea of the calendar many of us know today began in 1851, with a wooden calendar being made with a devotional being carved into the calendar. It wasn’t until the early 1900s for the calendar to become commercialized. In Austria, a newspaper company printed an Advent calendar for their readers; the next year, they inserted their own version of the calendar. Another newspaper company in the city of Hamburg, Germany, used a Christmas clock as the “countdown” for the holiday, being its own version of the Advent calendar. In 1908 one particular inventor’s clever idea boomed the calendar’s popularity and success. Gerhard Lang has been formally credited for the advent calendar that we have grown to love and adore today. Being from Germany himself, Lang’s inspiration derived from his mother, who made him this model as a child, with colorful pictures and figures drawn on the calendar. Lang made a cardboard style that was delivered through newspapers, allowing for a “swing door” to be on the calendar. With this innovation, the calendars could “contain” an object or a quote. The calendar with the swing door is secured; it requires for the participant to open the door, where they discover their prize and obtain the goodie inside. In this time frame, the goodie was either a picture or a quote. As the 1930s struck, Lang’s company had to close down, thanks to the rising tensions of World War II and a cardboard shortage occurring. The advent calendar was on hold until post- WWII, when the trend resurfaced. In countries like Germany, the calendar was seen as a refreshing glimpse of hope and nostalgia for the better days. As the 1950s appear, the advent calendar started to put chocolate into the mix, allowing for the present of the day to be a little treat. Coincidentally, as chocolate began to enter the European map of the calendar, Americans jumped on board too. President Dwight Eisenhower has been credited with bringing the Christmas calendar to the states, giving them to his grandchildren. Today a lot of different Advent Calendare are sold sale prior to the first day of December, and the calendars are reasonably priced. Nearly every retailer supplies the calendars, and nowadays they can contain everything from traditional paper drawings and rhymes to chocolates, alcohol and even Lego. While the Advent calendar is considered one of the beloved moments of Christmas, it should also be known one cannot celebrate it wrong! If you want to continue this fine tradition and create your own Advent Calendar online, please order on the button below. It might not be filled with candy, but it will be a perfect reason to bring visitors to your website day after day in December. Read more about Christmas Calendar Online and checkout the calendar demo. Order your online Advent Calendar here!